Marsha Angus (dharma name: Dainin Genyaku, Great Patience, Inconceivable Leap) received lay ordination in 1979 from Richard Baker Roshi, was shuso at SFZC in 2007 and received lay entrustment in 2010 from Dairyu Michael Wenger. She started practicing at Green Gulch Farm in 1975. She has had a private psychotherapy practice for over 40 years. She leads small meditation/study groups in Mill Valley & Tiburon. She's taught classes at SFZC on the heart sutra, the 4 noble truths and co-taught the first year long Establishing the Path of Practice for lay practitioners. She's a member of a dharma group of priests and lay practitioners that meets monthly. 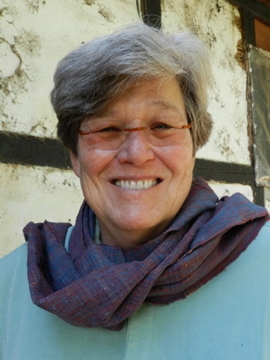 She lives in Mill Valley with her partner, Kiku Christina Lehnherr, who is a Soto Zen priest and teacher and currently abiding abbess at SFZC city center.